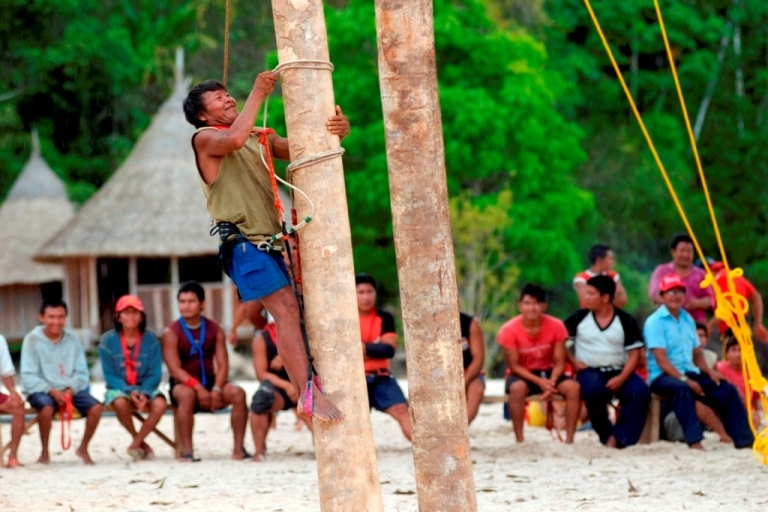 On May 28, Caura Weichojo, an independent Venezuelan non-profit, will host the 4th Palm Climbing Competition and Workshop on the large beach below Para Falls, on the Caura River. Caura Futures provides gear and training for the event. We first started with hand-tied, somewhat painful and awkward-to-adjust slings back in 2002. Now, we are busy making a new load of the gear that we designed in 2008. The unusual stiff rope that we use allows both efficient gripping and movement up a palm trunk. We have launched the project on Indie GoGo and need help spreading the word! You can see the gear demonstrated there. The logistical challenges of gathering together 100+ climbers from all over the Caura Basin and beyond will require all of our attention in the next three weeks. Oenocarpus palms should be in fruit at the same time, and we hope the Venezuelan video crew gets some great footage of the event. We are also introducing the gear to a select few fruit harvesters in Iquitos, Peru, and look forward to expanding the project there soon.